SYRACUSE, NY--(Marketwired - February 01, 2017) - Anaren, Inc.'s Wireless IoT Group announced today the introduction of its high performance Wi-Fi module (A43364) as the latest addition to the company's ecosystem of AIR wireless products targeting the IoT applications market. Featuring the Cypress CYW43364 Wi-Fi system on chip (SoC), the Anaren A43364 is the first Wi-Fi module that incorporates an STM32F412, STMicroelectronics ARM Cortex-M4-based microcontroller. With 1MB of on-board flash memory, the module obviates the need for additional storage memory and thereby offers cost savings and greatly improved overall performance. To date, Anaren has deployed over 30,000 development kits, shipped over a million certified modules, and currently supports thousands of registered users. The new AIR Wi-Fi module now helps accomplish an elusive goal: giving customers the ability to develop their product using reliable and high-performance hardware and fantastic supporting software at unprecedented speed. The much-anticipated release of Atmosphere 2.0 also includes that ability for all existing BLE projects, to now-have cloud connectivity through using the mobile device as the gateway. Aimed at first-time developers as well as established OEMs poised for large-scale IoT rollouts, when used with Anaren's Atmosphere IDE, developers of any level will be able to build embedded, mobile, and web applications -- simultaneously -- from the Atmosphere 2.0 web-based console. This is entirely unique in the industry and allows virtually anyone to create and deploy cloud-connected IoT products within weeks instead of months, and without having to employ numerous specialized developers. "The Anaren A43364 Wi-Fi module is superior to anything like it presently on the market, hands down. Its performance is rock solid. This release now also completes the Anaren Atmosphere 2.0 development ecosystem, featuring Atmosphere Cloud™ hosting. With the Wi-Fi module and Atmosphere, we offer Wi-Fi developers the most cohesive and comprehensive IoT creation environment available, one that is unlike any other in the industry," said Jeff Liebl, President of Anaren's IoT Group. "Cypress knows and appreciates the value of working with Anaren as a key partner for our WICED® IoT platform ecosystem, and we are pleased to now have them bring our world-class Wi-Fi connectivity to more IoT developers," said Andrew Hunter, Senior Director of Marketing at Cypress. "Anaren has shown tremendous success with our BLE products built into their devices, and I expect they will continue to enable customers to get to market with embedded, industrial, and cloud applications faster than anyone," added Hunter. Anaren's A43364 Wi-Fi module is based on the Cypress Wi-Fi chipset, with an integrated ARM® Cortex®-M3 processor, and single band 802.11b/g/n with complete Wi-Fi functionality. Incorporated into the module is an STMicroelectronics STM32F412 ARM Cortex-M4-based microcontroller with 1MB of flash memory, making the A43364 the first module on the market with this configuration. Additional module highlights include 37 general-purpose input/output (GPIO) pins, support of several peripheral interfaces, small size, low cost, and pre-certification for numerous global standards. The A43364 Wi-Fi module will be available in two variations: with an on-board printed circuit board (PCB) antenna (A43364A) and an external antenna using a U.FL connector (A43364C). The module is FCC, IC, and ETSI certified. A limited release for the module is scheduled for this month, with the product expected to be for sale throughout Anaren's distribution network in March. Download the datasheet for the A43364 Wi-Fi module here. 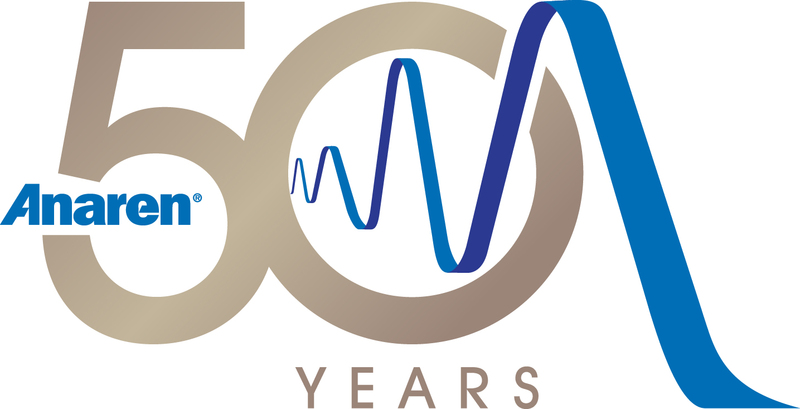 Now in its 50th year in business, Anaren, Inc. designs, manufactures and sells custom high-frequency solutions and standard components for the wireless communications, space and defense electronics, wireless consumer electronics, and IoT markets. Founded in 1982, Cypress is the leader in advanced embedded system solutions for the world's most innovative automotive, industrial, home automation and appliances, consumer electronics and medical products. Cypress's programmable systems-on-chip, general-purpose microcontrollers, analog ICs, wireless and USB-based connectivity solutions and reliable, high-performance memories help engineers design differentiated products and get them to market first. Cypress is committed to providing customers with the best support and engineering resources on the planet enabling innovators and out-of-the-box thinkers to disrupt markets and create new product categories in record time. To learn more, go to www.cypress.com. Celebrating 50 years in business.